Overall, survival for cancers affecting children and young people has improved in the UK in recent decades. 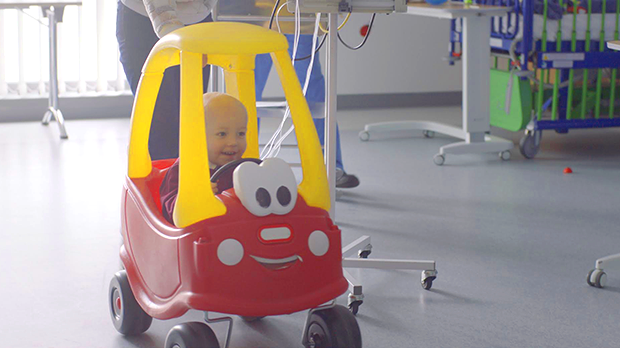 Find out more about the impact our work has had on beating children’s cancers. What is Kids & Teens? Cancer Research UK Kids & Teens is a campaign that raises money to beat cancers affecting children and young people (aged 0-24). The money raised supports vital research to find new, better and kinder treatments so more of this age group survive cancer, and do so with a good quality of life. September is Childhood Cancer Awareness Month. Show your support by donating, volunteering or buying a gold ribbon pin badge in your local Cancer Research UK shop. Cancer Research UK is a major funder of children's cancer research in the UK. We want to help improve survival and reduce long-term treatment-related side effects. That's why we're working hard to develop new, better and kinder treatments for children and young people with cancer. More children and young people than ever are surviving cancer in the UK. But there’s still work to do. Every year, around 520 children and young people die from cancer in the UK. And some survivors experience long-term treatment-related side effects, like hearing loss and infertility. These can affect their health and quality of life for the rest of their lives. Find out about the different types of cancers that affect children and young people on our ‘About Cancer’ pages . You can also find out about the different types of treatment, and support available. The Cancer Research UK Kids & Teens Star Awards, supported by TK Maxx, recognise the strength of children and young people who have been affected by cancer. Every child nominated receives a trophy, t-shirt, certificate and a £50 TK Maxx vouchers. Their siblings get a special certificate too. Frankie was diagnosed with hepatoblastoma, a type of liver cancer, in August 2016 when he was two years old. His treatment included chemotherapy and an operation to remove his gall bladder and half of his liver. The treatment went well and right now, Frankie is starting school. Mia was diagnosed with acute myeloid leukaemia in July 2016 when she was four years old. As part of her treatment, she had several rounds of chemotherapy and a bone marrow transplant. The treatment was successful, and right now, Mia is doing well and is starting back at school. Get involved and support Cancer Research UK Kids & Teens. Together we will beat children's cancers.